This collection--of the stories of scholars who have found a lifelong commitment to the teaching of writing--includes the professional histories of 19 rhetoricians and compositionists who explain how they came to fall in love with the written word and with teaching. Their stories are filled with personal anecdotes--some funny, some touching, some mundane. All of the stories are fascinating because they demonstrate how scholars' personal and professional lives intertwine. These stories also help to situate the scholars, their work, and, importantly, the development of the profession. They reveal how the field of rhetoric and composition is shaped by the confluences of various disciplines such as literary studies, creative writing, philosophy, and education. Of note are the disparate paths and backgrounds that people have taken to achieve their professional stature. The narratives, however, are most revelatory in describing the forging of a discipline as it reasserts its value within the academy and to the students it serves. Arranged in a loose chronological order, the essays reflect the progression of rhetoric and composition studies from the ad hoc scrambling of post-World War II teachers into a vibrant and growing discipline with more than 70 doctoral programs producing specialized scholars, researchers, and teachers of writing. The chapter authors represent the variety of camps that now comprise the diverse discipline of rhetoric and composition. Whether historian, researcher, theorist, or practitioner, however, what these contributors share in common is being teachers. The narratives are collected from senior members of the profession so that their stories can be preserved for future generations of scholars and teachers in the field. This collection is not only a record of their contributions and some of the benchmarks in the field, but an opportunity for the writers to provide us with their reflections and retrospection. Keep in mind as you read their stories that they are narratives for the most part, and as such, are transient. They take us to a certain point in the writer's life, but stop while the writer goes on. Still, they provide an orientation to the profession while revealing the scholar behind the scholarship. "…the nineteen narratives collected in this volume give us the professional-and often intensely personal-life of the discipline as told from the first-person perspective of some of its most prominent scholars…all demand to be read, not only for what they say about what it means to 'make it' in this field, but also for how such stories go on making and remaking the field through the act of their telling." 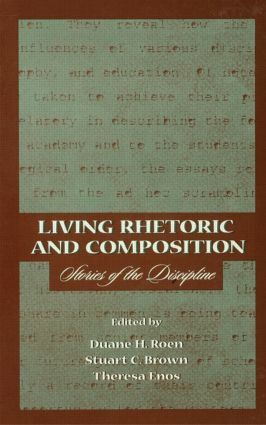 "I just finished reading Living Rhetoric and Composition in one day…I could not put the book down. I read the whole thing, cover to cover, at one sitting….To my knowledge, there is nothing like this in the discipline….The contributors describe moments in which they were forever changed. I believe that many readers will be, as I was, forever changed by reading these stories." "I found this book intriguing, and more important, a challenge--not to what I think but to how I behave…. The opportunity to meet these men and women over coffee, so to speak, is a most notable feature that I find remarkably appealing." Contents: A.A. Lunsford, Foreword. D. Roen, S. Brown, T. Enos, Preface: Scholar/Teacher/Story Teller. E.P.J. Corbett, How I Became a Teacher of Composition. J. Lauer, Getting to Know Rhetorica. C. Bazerman, Looking at Writing; Writing What I See. W. Bishop, Heart of Gold. R.M. Coe, The Zen of Writing as Social/Symbolic Action. W.A. Covino, Truth or Consequences. F.J. D'Angelo, In Search of the American Dream. R.L. Enos, The Curious Case of Harry Caplan's Hat, or, How I Fell in Love With Rhetoric. T. Enos, Road Rhetoric--Recollecting, Recomposing, Remaneuvering. R. Fulkerson, How Way Leads on to Way. J.L. Kinneavy, A Backward Look at 55 Years of Teaching Writing: 1941-1996. R. Lloyd-Jones, Doing as One Likes. D.H. Roen, The Education of a Wisconsin Farm Boy. J. Trimbur, Close Reading: Accounting for My Life Teaching Writing. V.J. Vitanza, Love, Lust, Rhetorics (From Double Binds to Intensities). K.E. Welch, Technology/Writing/Identity in Composition and Rhetoric Studies: Working in the Indicative Mood. E.M. White, On Being a Writer, Being a Teacher of Writing. W.B. Horner, The Long Look Back. S.C. Brown, Have Rhetoric, Will Travel. J.J. Royster, Afterword. Appendix: Annotated Bibliography: A Guide to Professional Development.